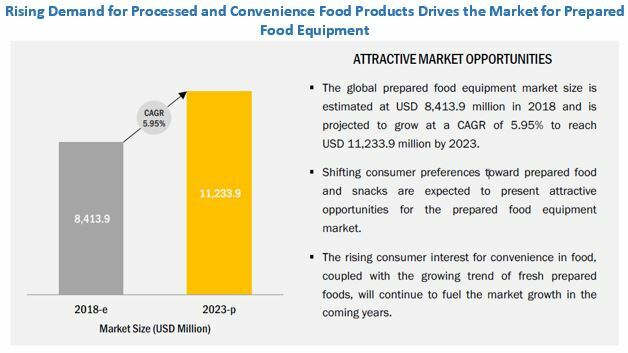 [158 Pages Report] The prepared food equipment market was valued at USD 7.96 Billion in 2017 and is projected to reach 11.23 Billion by 2023, at a CAGR of 5.95% during the forecast period. Determining and projecting the size of market with respect to type, application, mode of operation, and regional markets, over the period ranging from 2018 to 2023. The key players have been identified through different secondary sources and information on market data was gathered through sources such as the European Federation of Catering Equipment Manufacturers (EFCEM), North American Association of Food Equipment Manufacturers (NAFEM), and Ministry of food processing industries, while their market share in respective regions was determined through both, primary and secondary research. The research methodology includes the study of annual and financial reports of top market players, as well as interviews with industry experts (such as CEOs, VPs, directors, and marketing executives) for key insights (both quantitative and qualitative) for the prepared food equipment market. 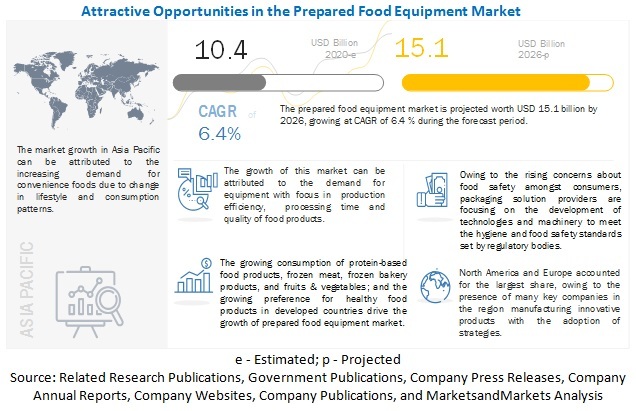 The various contributors involved in the value chain of the prepared food equipment market include component suppliers and prepared food equipment manufacturing companies such as GEA Group (Germany), Alfa Laval (Sweden), The Middleby Corporation (US), Marel (Iceland), and Buhler (Germany). Other players in the industry include Welbilt (US), Hughes Equipment Company (US), Heat and Control Inc. (US), Bigtem Makine (Turkey), and Hup Sheng Machinery & Industry (Malaysia). This research report categorizes the global market based on type, application, mode of operation, and region. Based on type, the market has been segmented into pre-processing, processing, and packaging. The processing segment accounted for the largest market share of the global market in 2017. Processing is further segmented into blanching, cooking, and seasoning & coating. The pre-processing segment is segmented into sorting & grading, mixing & grading, and others which include conveying, picking, and placing. The packaging segment is further segmented into primary and secondary packaging. North America accounted for the largest share in the global market, in terms of value, in 2017, owing to the increasing automation industry. Asia Pacific is expected to overtake the North American market for prepared food equipment by 2023. 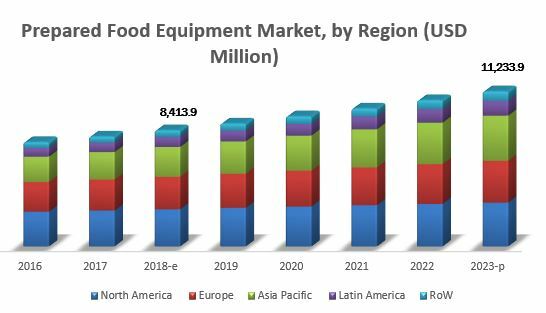 The wide acceptance and availability of prepared food equipment in the US, Canada, and Mexico, along with their growth potential, are the major drivers contributing to the growth of the North American prepared food equipment market. The key players in the global market include GEA Group (Germany), Alfa Laval (Sweden), The Middleby Corporation (US), Marel (Iceland), and Buhler (Germany). Other players in the industry include Welbilt (US), Hughes Equipment Company (US), Heat and Control Inc. (US), Bigtem Makine (Turkey), and Hup Sheng Machinery & Industry (Malaysia).